Elder David T. Moss is the Overseer of the Mt. Zion Fellowship Intercessory Prayer Ministry. He graduated from Jane Addams Vocational High School where he served as Musical Director over the Gospel Choir. He attended Cleveland State University where he earned a Bachelor’s of Arts Degree in Biblical Studies. Elder Moss was led to Mt. Zion Fellowship in 2006 under the leadership of Dr. C. Ronald S.Williams II. Shortly thereafter, he was ordained as a Minister. After serving faithfully on the Ministerial staff, in May of 2011 he was elevated to the position of Elder by Dr. Williams. 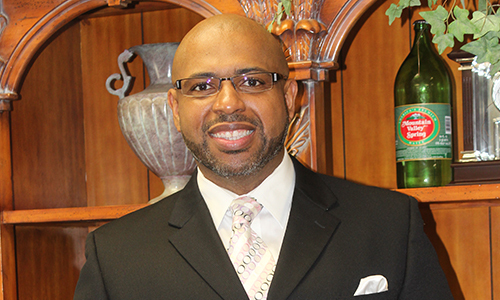 Elder Moss also serves as a member of the Executive Trustee Board and teaches Adult Sunday School. In addition to having the heart of a servant by visiting the sick and incarcerated, Elder Moss has been involved with the Cleveland Sight Center and AIDS Taskforce of Greater Cleveland serving those who are in need. He has a burden for the people of God! He is currently employed with the American Cancer Society.